Despite the fact that the famous portrait painter was seriously ill, he did not show how the artists – the Wanderers, all the burdens and deprivations of the life of the people. On the contrary, the winter is for the artist, this is a fun sleigh ride, booths, merry-go-rounds, festive folk festivals, brightness and colorfulness. Direct contrasting gray and boring life. For Kustodiev, Shalyapin was an idol from a young age and a friend. This is the favorite composition of the artist. The foreground of the picture is enlarged. Bottom has a large space. The long-awaited spring is just around the corner. People poured into the street to meet the spring. But winter still clings and does not want to give up her place. This is noticeable in the snow-covered snowdrifts. You can see how a group of people fun sledding. Everywhere there are trays and fairgrounds. 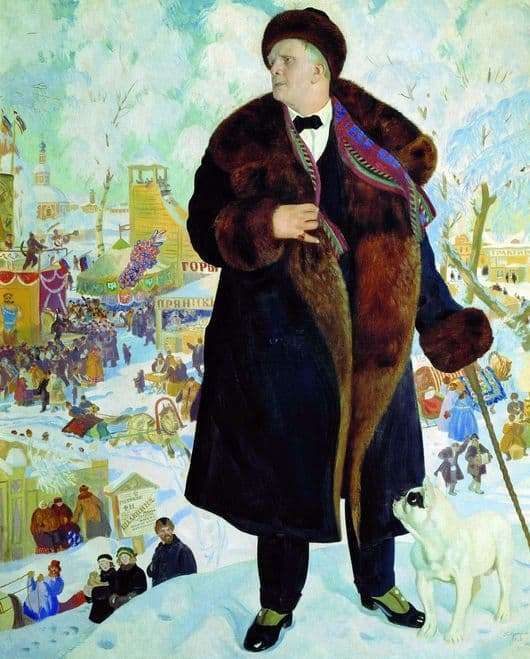 And over all this fun towering Fedor Ivanovich Shalyapin’s stately figure in a fur coat is unbuttoned. And next to him is a funny pug. The master had to ask the cat to sit on the dais, so that the pug, looking at her, could “pose” to the artist. The singer as if from the height of his height looks at an unfamiliar town where he will have to perform. Poster about his concert at the bottom of the hill. Chaliapin walks through the streets of the town in anticipation that all viewers will appreciate his talent. The artist allowed himself a share of cunning and showed the narcissism of a famous singer. The character is dressed in an open fur coat, although it is still freezing outside. It can be seen that his clothes are made of beaver fur. On the little finger in Chaliapin’s expensive ring. He is wearing suede shoes, it is immediately clear that it is not according to the weather. And in order not to slip and fall on a slippery road, the singer has to lean on a cane made of precious wood. In the background of the picture you can see the daughters of Fedor Shalyapin: Marina and Martha, and his friend and secretary Yard. The artist performed this picture twice in 1921 and 1922.